Dennis Palaganas' page Incomplete solution. Let the faces be denoted by the letters L, R, F, B, U and D (Left, Right Front, Back, Up and Down). Clockwise quarter turns of a face layer are denoted by the appropriate letter, anti-clockwise quarter turns by the letter with an apostrophe (i.e. L', R', F', B', U' or D'). Half turns are denoted by the letter followed by a 2 (i.e. L2, R2, F2, B2, U2 or D2). The above is the same notation as for the 3x3x3 cube. There is however a new type of move. The internal slices will be denoted by the lowercase letters l, r, f, b, u and d, and the type of move is shown in the same way as normal face moves. Note that these letters mean the slice adjacent to the faces only, so such a move will not disturb the corners or the face centres of the cube. Occasionally we will want to rotate the central slice, the one parallel to the floor, between the u and d slices. This will be denoted by the letter m, where the direction of the move is as seen from above, so the moves m and u both move in the same direction. 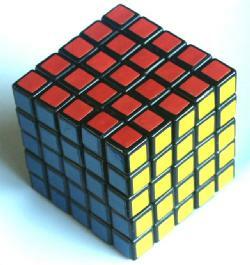 There is one more type of algorithm which is especially effective on this cube. It involves putting the centres correct, joining up edge pieces, and then solving it as if it were a normal 3x3x3 Rubik's cube. It is relatively simple, as only a few new sequences are needed.